In early 1924 a paddock (now playing fields near the inner Canberra suburb of Dickson) was the ‘designated’ airfield for Canberra and known as the Northbourne Aviation Ground. However, as Canberra was not a scheduled destination, it was mostly used for emergency landings for aircraft on domestic routes such as Sydney to Adelaide. In late 1926, with the opening of Parliament House approaching and celebrations with a Royal Australian Airforce (RAAF) flying display, the Dickson airfield was considered unsuitable to host the variety of aircraft expected. Instead, a paddock in the Majura Valley owned by the Campbell family, graziers at the time, was deemed by Airforce Captain Henri Petre to be ‘absolutely ideal for flying’, with landing distances of ‘not less than 1000 yards in all directions’. So in 1926 this site at the corner of the Majura Valley Road and the Queanbeyan-Duntroon Road was leased to the Department of Defence. Four years later it was handed over to the government’s then-civil aviation control. 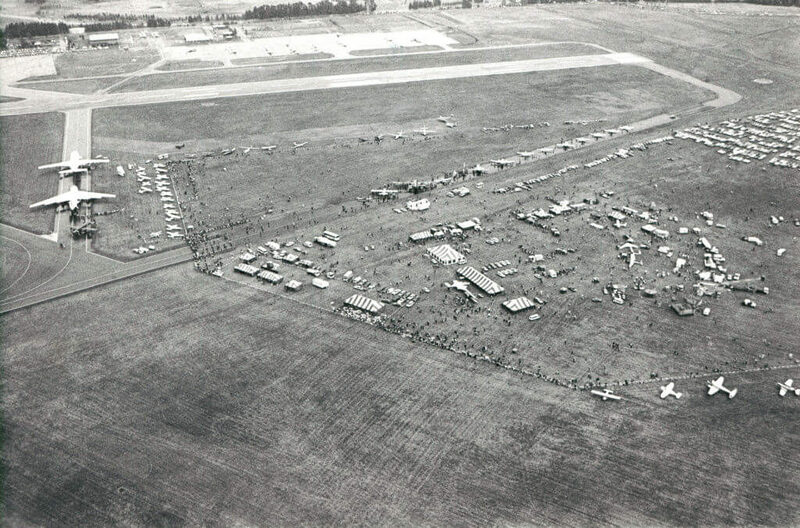 RAAF may have erected a wooden hut for service personnel attending the opening of Parliament House, but the first building formally documented at the ‘Duntroon Aerodrome’ (later to become Canberra Aerodrome) was a large hangar in 1936 at the site where the northern end of Canberra’s present terminal stands. By 1939 work had already begun on construction of a military base on the opposite side of the aerodrome from the civilian hangar. From this time until 2003, when the RAAF base was decommissioned, the airport operated for the needs of both defence and civil aviation. The remaining defence presence on the north-eastern side of the airport now operates the Prime Minister’s VIP fleet of aircraft. Throughout these decades, the airport runways continued to be upgraded and lengthened as aircraft sizes increased and aircraft began landing with greater frequency. The airport terminal too, underwent some major changes. Firstly, it was façade improvement in the early 1950s, followed by small extensions. Between 1960 and 1970 passenger numbers exploded from 206,096 a year to more than half a million, so in 1970-71 a bigger terminal was built. In late 1980, with news of the forthcoming opening of New Parliament House in 1988, a new domestic terminal was needed requiring a major restructuring of the existing terminal. Rolling additions continued throughout the early 1990s. In 1998 the Federal Government sold the Canberra Airport to Canberra businessman Terry Snow and his family. It was an airport with declining facilities and rundown aviation infrastructure. The existing terminal alone had 42 different floor levels, having been renovated, added to and built in so many stages. At that time each end of the terminal was owned by existing airlines who had control over capital works, so major upgrades could not be undertaken. It wasn’t until Terry Snow was able to purchase the ex-Ansett end of the terminal from administrators that major upgrades could begin, if not over the whole site, then at least on key pieces of infrastructure. These included major runway, apron and car park upgrades, a new hangar, development of a new entrance, and internal facilities. After negotiations with Qantas, the Airport reached an agreement on developing a completely new terminal on the existing site. By 2009, the Canberra Airport AirVolution had begun. A new, two-level, dual-lane, axial road system forms the new entry and exit road to the terminal. Just outside the airport boundary, Pialligo Avenue was also duplicated and connected to this entry road using an overpass system allowing for an undisrupted flow of traffic. Five new car parks were constructed, providing a total of 3,700 car spaces including two multi-storey structures that feature state-of-the-art parking guidance systems that allow vehicles to be located. This included the development of four new aircraft parking positions plus the gradual reconstruction of the entire aircraft parking apron to increase its bearing strength allowing for use by larger aircraft. New retail and food and beverage outlets. With the opening of the new terminal on 13 March 2013, Canberra Airport now represents one of the most significant infrastructure projects for the ACT and surrounding region, with a growing role as a national transportation hub, commercial business park and retail destination. It has been acknowledged as one of the leading Australian airports, having been named Australian Airport of the Year in 2002, 2007 and 2013. In 2016 Singapore Airlines announced it would commence international services to Canberra. On 16 September 2016, Singapore Airlines flight SQ 291 touched down at Canberra Airport, ushering in a new era of international flights for the nation’s capital. Dubbed the “Capital Express”, the four-weekly service operated between Singapore, Canberra and Wellington. In February 2018 Canberra Airport welcomed a second international carrier, with Qatar Airways beginning international service between Canberra and Doha. This daily service connects Canberrans with over 150 international destinations, including over 40 European cities. That same year, Singapore Airlines announced a shake-up of their Canberra route, replacing the Capital Express with a new, daily service between Canberra and Singapore. The service also features an upgraded aircraft, making Singapore Airlines the first airline to offer all four cabin classes on international flights to and from Canberra. As Capital Airport Group celebrated 20 years in 2018, the future looks bright for our airport. With two daily international services, three thriving business precincts and one of the most impressive airport terminals in the country, we’re well on the way to achieving our goal of becoming the Best Little Airport in the World. But the hard work doesn’t stop. We plan to continue to make air travel more and more accessible for Canberrans, with a focus on encouraging more international carriers, as well as low cost carriers to the nation’s capital. Our focus is also on welcoming visitors to Canberra. In 2018 our ‘criminally overlooked’ city got the recognition it deserves, being named a top ten city in Lonely Planet’s best in travel 2018. Canberra Airport is here to welcome visitors to this top ten city, with a world class facility and a ‘here to help attitude’.